Now we know Amazon as the largest electronic commerce and cloud computing company based in Seattle, Washington. On September 4, 2018, Amazon reached US$1 trillion in value, becoming the second publicly traded US company to do so after Apple. Amazon wasn't always a monster of a company, back in 1994 when Jeff Bezos founded this company, it was started as a small online company. What are the secrets of the successful trader? Do you often find yourself wondering how “some successful trader just have all the luck”? The answer is YES, they are lucky. But what you don't know is that they are creating their our own “luck”. Because, people who consider themselves lucky do tend to exhibit certain traits. Find out here and how you can be a lucky trader too. The principles of Technical Analysis are derived from hundreds of years ago when people started studying commodity prices. 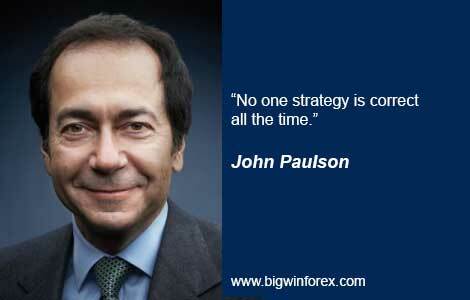 John Alfred Paulson is a famous investor and hedge fund manager. He leads Paulson & Co., a New York-based investment management firm. He has been called "one of the most prominent names in high finance" and "a man who made one of the biggest fortunes in Wall Street history". Paulson became world-famous in 2007 by shorting when the subprime mortgage crisis and earned "almost $4 billion" personally. Are You Ready To Play The Trading Game?